NEW DELHI: A four-tier GST tax structure of 5%, 12%, 18% and 28%, with lower rates for essential items and the highest for luxury and de-merits goods that would also attract an additional cess, was decided by the all- powerful GST Council on Thursday. The lowest rate of 5% would be for common use items while there would be two standard rates of 12% and 18% under the Goods and Services Tax (GST) regime targetted to be rolled out from April 1, 2017. Announcing the decisions arrived at the first day of the two-day GST Council meeting, finance minister Arun Jaitley said highest tax slab will be applicable to items which are currently taxed at 30-31% (excise duty plus VAT). The cess, he said, would be lapsable after five years. Jaitley said about Rs 50,000 crore would be needed to compensate states for loss of revenue from rollout of GST, which is to subsume a host of central and state taxes like excise duty, service tax and VAT, in the first year. 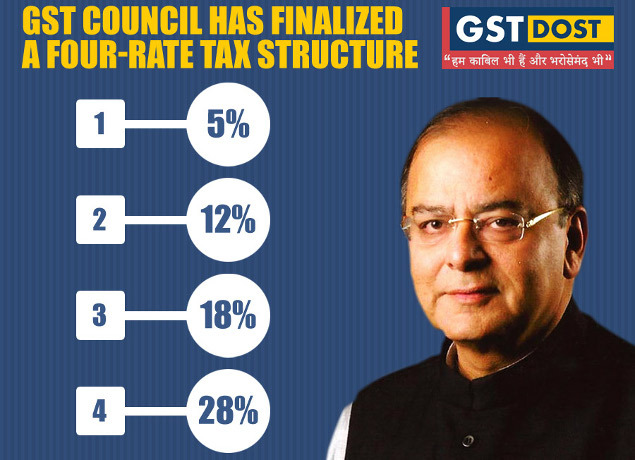 The four-tier tax structure agreed to has slight modification to the 6%, 12%, 18% and 26% slab that were under discussion at the GST Council last month. While the Centre proposed to levy a 4% GST on gold, a final decision was put off, Jaitley said. The long-delayed tax, which would transform Asia's third largest economy into a single market, is expected to boost revenues through better compliance while making life simpler for business that now pay a host of federal and state levies. Arun Jaitley will seek parliamentary approval for bills later this month that would set the rate and scope of the GST. State assemblies must also approve similar bills for the tax to enter force as planned next April 1.